This web site is NOT a Gannett web site: It's NOT done by Maria De Varenne it's just a woman reaching out to the mainstream media wanting "humanity"
Dept. of Energy Fraud Happened- The taxpayers were "raped" by a foreign company that does business with IRAN. The Gannett owned Tennessean did NOT report stories to protect President Obama. I’ve started a blog to get your attention. Nissan is committing major fraud and the state is letting them waste bond money. NISSAN holds about 4 Billion in IDB debt. They’ve started taking that money in 1982, I’ve been told the company “keeps rolling them over” and can NEVER pay back the money. The collateral for the DOE loan is a Rutherford County IDB bond and NISSAN does not have the technology to build the car they told congress. NISSAN lied and used technology from the 90’s they needed the American DOE money because they had a cash flow problem The VP of Purchasing Catherine Perez told me then Dominique Thormann the former SVP of Administration and Finance has used a “good ole boy” network to terrorize me. It sounds crazy but it’s TRUE. Please read about this. Gender Cleansing is Happening in Tennessee & Maria is Ignoring it WHY? 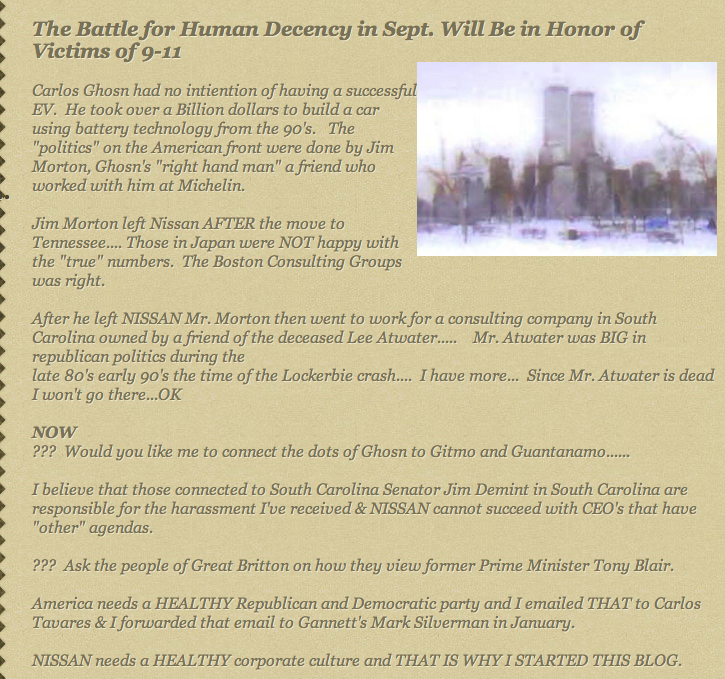 Mark Silverman fed Tennessee "crappy" journalism that was a LOT more digestible than what is NOW on the menu in the Gannett owned Tennessean: One NOW former subscriber said "we thought it couldn't get worse....Now reading it is just a waste of time"
Gannett Ignored Story of NISSAN dealing with Iranian Terrorist.... 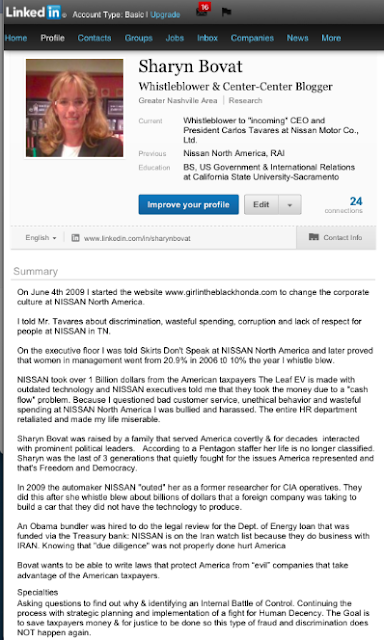 Instead on Sunday they "ran another puff piece"
www.IranWatchList.com In 2011, Nissan was also awarded a contract, valued at roughly $1 billion, from the City of New York for the production of taxis beginning in 2013. The NISSAN Leaf REALLY Cost About 80K to Make Gannett Knows & Gannett Looks the Other Way While Taxpayer Money is Wasted. Vietnam Vets KNOW that Gannett has NOT told the "whole story" in reference to agent ORANGE. The CIA payed France/Michelin $600 per Rubber Tree that was destroyed in Vietnam. Children who died were worth $120. Why does Gannett ignore the story of a whistle blower ? Why is the paper silent? Is it the President's Pet Project? Bottom Line: For the state to prosecute a misdemeanor for 19 months - have me jailed 3 times and to spend all the money prosecuting me for a crime that's = to a speeding ticket is INSANE. So NOW I rebuild my life. I was just invited to a couple "cool" parties in Washington DC. I will also launch a blog about Green Fraud: I look forward to blogging a CPAC. Also, I will try to get a job and "maybe" I can finally say "good bye" to Tennessee. I asked the former Tennessean editor Mark Silverman if he knows any republicans and asked him to "help" me get a job. He's a decent guy and KNOWS i was "railroaded". To those of you I've emailed so many times.... THANK YOU for reading. Also, this is an example of media bias. What Randy McClain did by not including the issue of the Rutherford county 3,950,000,000 idb debt of NISSAN is morally wrong. Most likely "one" of the members of the jury will read the Tennessean and they can "talk" about the good things Nissan does for the community. I would hope NOW the judge lets me talk on WHY I whistleblew. There's a a reason WHY Americans did NOT want SOPA. People fear that "big business" is trying to hurt "Freedom of Speech". Maria De Varenne: It's time YOU had respect for ALL People and that includes republicans. 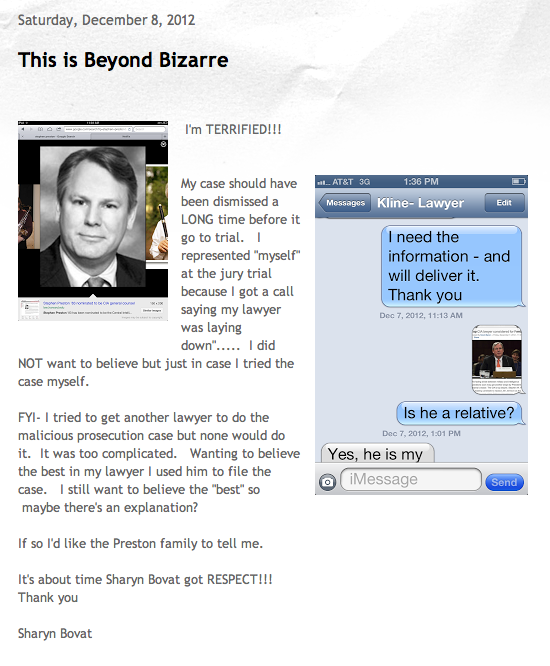 Sharyn Bovat does not understand WHY? I've been blogging since June: Does the Mainstream Media Fear My Issues will Become News? Why did Maria De Varenne have a lawyer send Bovat a letter? Mark Silverman has NEVER done that. Bob Dickey did NOT do that. Kate Marymont did NOT do that..
Mark Silverman told me Gannett did NOT send me a letter AFTER I started www.gannettmcnews.com because of "Freedom of Speech". Maria maybe you should spend some time with your predecessor. He's a smart man! Also I own www.CarlosTavaresRenault.com and NEVER did Carlos Tavares tell me to stop. My issues are "real" and I feel like I'm being bullied. Maria De Varenne.... There's a a reason WHY Americans did NOT want SOPA. People fear that "big business" is trying to hurt "Freedom of Speech". I want to resolve this "respectfully". PLEASE I have high blood pressure, my child has suffered having a mom that's a whistle blower and fighting for "another" one of my constitutional rights is not what I want to do. I have made it "quite clear" that www.mariadevarennetennessean.com is not affiliated with YOU or Gannett. Please call me "directly" if you have a problem. Thank you for forwarding the letter to me and I'm confirming it's receipt. Also, I appreciate having 5 days upon receipt of the letter. FYI- I have not used that other email account because I believe it was "hacked into" and have not yet received the letter by mail. Sir, I'm respectful to Gannett & to the Tennesseean. NOBODY thinks that my website is officially a Gannett. So that part of your letter I disagree. In fact people know it's a way for me to have "freedom of speech"
I've already told Gannet executive Mark Silverman that I'm planning on taking down a website for his birthday. Sir, Not everyone at Gannett hates me After I started Gannett McNews I asked a Gannett executive WHY I did not get a letter and the Ben Bradlee winner said " Freedom of Speech". I guess his successor does not feel the "same" about the constitution? In reference to the issues of my using articles: I believe I have used a "small" part of an article and then I have people "click the link" so that they can read the article on the Tennessean site: which actually gives gannett revenue. The only article in full that I'm aware of is on that was cached. Also the one that says that Nissan is 3,95 Billion in IDB debt (they are NO LONGER available for people to read. Sir, how can society know what is going on if Gannett deletes articles from the server?. Part of the role of a newspaper is to provide knowledge to a community. The IDB debt is a big issue in Tennessee. I will un publish the Maria De Varenne website as per your request: I think your bullying me still I want to obey the request. I don't want Maria do "swear out" a warrant. What I would appreciate instead of signing the letter of demand is RESPECT. I would like to sit down with you and have YOU explain to me about the copy write laws. I've seen other websites with parts of Tennessean articles. Are you aggressively telling them to "cease and desist". I would like a response to that question in 48 hours. You NOW have my email address. It's "odd" that you used my old one since I've been emailing Gannett reporters for quite a while. Mr. Harvey, I would like to become a blogger that HELPS society. Sir, can you help me understand HOW I do that? Please meet with me and lets not start a legal battle. I just want humanity. Please see the attached letter, which was sent to another one of your email addresses on January 11, 2012. Please see the accompanying letter. We look forward to your anticipated cooperation. Gannett Allowed for a whistleblower to be bullied for YEARS and refuses to report stories about companies that discriminate and commit fraud "most likely" to increase ad revenue. Society is NOT healthy with Gannett and the Tennessean lack of reporting on stories that matter. 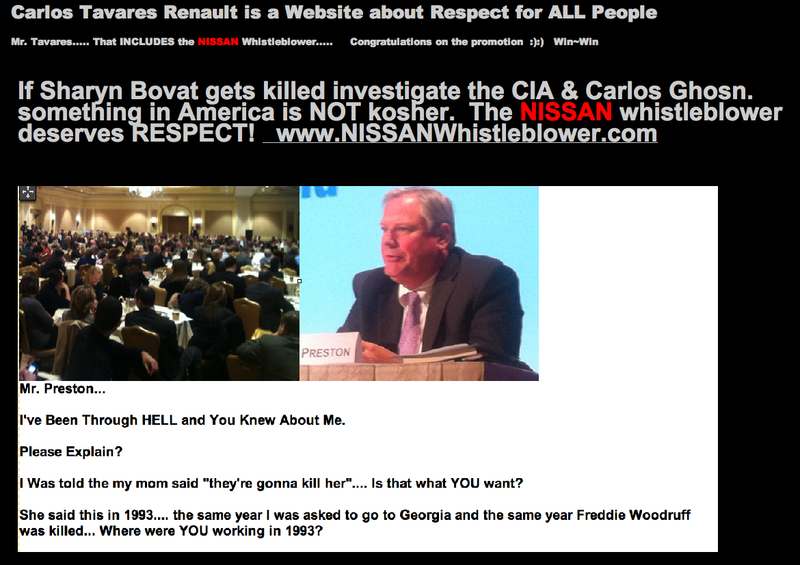 If Sharyn Bovat gets killed investigate the NISSAN CEO Carlos Ghosn, Bill Krueger, Scott Becker, Mark Stout, Marlin Chapman, Erich Marx, Jon Brancheau, Joe Castelli, Tracy Woodward, Brian Carolin & others. WHY? 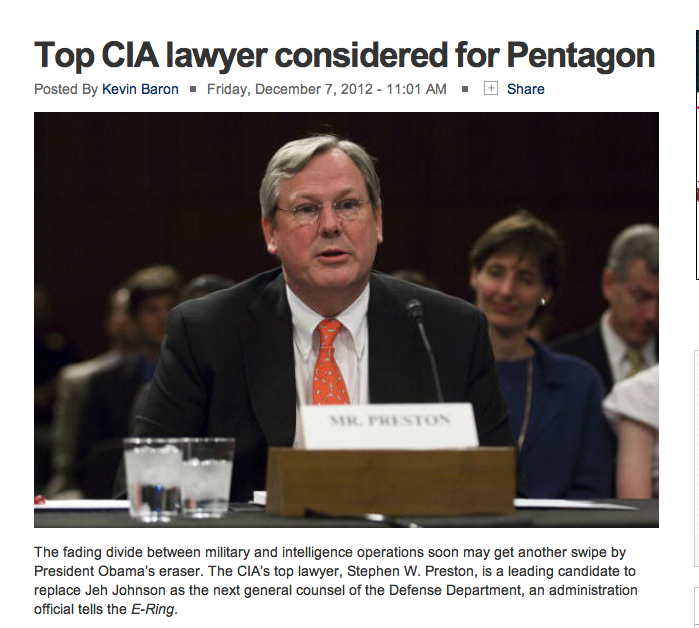 Did Sharyn Bovat's lawyer NEVER tell her his brother was the TOP CIA lawer. Content copyright . MARIADEVARENNETENNESSEAN.COM. All rights reserved.